Last week I shared my rhombus afghan crochet project with you. Here is the pattern I promised. 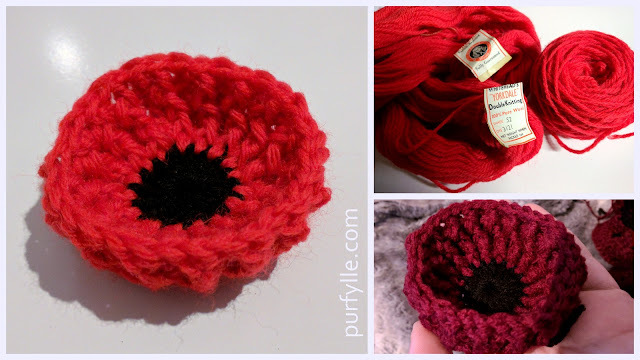 I used two 400 gram jumbo balls of 12 ply yarn and 5.5mm crochet hook which resulted in a very dense finish and a stiff hand which is just what I wanted for this project. Ch 3 (takes place of 1st DC) , 3 DC into first chain, turn work. SC into top of stitch just made, Ch 2 (takes place of 1st DC), DC into same space, DC, DC, 2 DC into last space, turn work. SC into top of stitch just made, Ch 2 (takes place of 1st DC), DC into same space, DC, DC, ,DC DC, 2 DC into last space, turn work. SC into top of stitch just made, Ch 2 (takes place of 1st DC), DC into same space, DC into the next 6 stitches, 2 DC into last space, turn work. SC into top of stitch just made, Ch 2 (takes place of 1st DC), DC into same space, DC into the next 8 stitches, 2 DC into last space, turn work. SC into top of stitch just made, Ch 2 (takes place of 1st DC), DC into the next 9 stitches, DC2Tog, (total 10 DC and 1 decrease of DC2Tog) turn work. SC into top of stitch just made, Ch 2 (takes place of 1st DC), DC into the next 7 stitches, DC2Tog, - the last stitch (SC, Ch2) of previous row is not worked. (total 8 DC and 1 decrease of DC2Tog) turn work. SC into top of stitch just made, Ch 2 (takes place of 1st DC), DC into the next 5 stitches, DC2Tog, - the last stitch (SC, Ch2) of previous row is not worked. (total 6 DC and 1 decrease of DC2Tog) turn work. SC into top of stitch just made, Ch 2 (takes place of 1st DC), DC into the next 3 stitches, DC2Tog, - the last stitch (SC, Ch2) of previous row is not worked. (total 4 DC and 1 decrease of DC2Tog) turn work. DC4Tog, (SC, Ch2) of previous row is not worked. 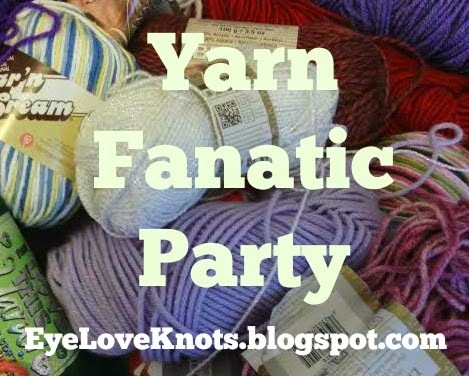 (SC into top of stitch just made, Ch 1 (takes place of 1st DC) leave the loop on the hook, *yarn over pull up a loop in the next stitch, *3 times - you should have 4 loops on the hook - yarn over and pull through all four loops. ) Ch 1 to close the decrease. Your first Rhombus shape is complete. To begin the next rhombus work into chain stitch just made and repeat rounds 1-10 until desired length is achieved. SS to finish section. Make as many sections as required for width of project. My rug has 8 rhombus for each row. The completed rug is made of 7 rows, 4 in the darker colour and 3 rows in the light coloured yarn. The second row of rhombus need to be begun half way through the rhombus shape. This allows the rows to be nested into the hollows of the previous row for joining as pictured below. Begin with a foundation row of 8 dc (equivalent to round 6), and continue from there as before. Finish the row of rhombus at round 6 as pictured above. The edging is worked along each long side individually. The rows are then joined. Once all the rows are joined the the top and bottom ends are edged. I edged my two outer rows and the center row in the same colour as the rhombus and all the other rows I edged with the contrasting shade. I used a plaited braid join to join my rows. It is the first time I have done this join and I shall do my best to describe it. I intend to do a picture tutorial in the future and will link to when it is done. sc into back loops of rsc, *ch 3, skip one rsc and sc into back loop of next rsc, repeat from* to end. Do this to both sides of every row. You should now have a zig zag from your first row to the row you are joining to and back again giving the appearance of a braid (plait). Repeat from * to ** until you have joined the rows all the way to the end. Repeat with every row until all rows are joined. Single crochet accross both top and bottom. the reverse single crochet in the stitches of the previous round. Work in any loose ends and your done! 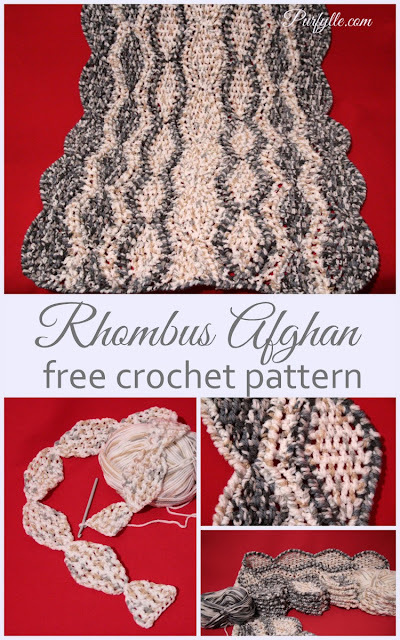 Learn more about the design and view more photos of the Rhombus Afghan click here..
this is pretty cool! No only the design, but love the colors you used too :) awesome that you shared the pattern! I'm totally in love with the blue/greys which I also used in the zig-zag throw, and I keep having this vision for it to be paired with a creamy white which is why I chose the other shade but the white in the same yarn is a super bright white and doesn't look right to me. 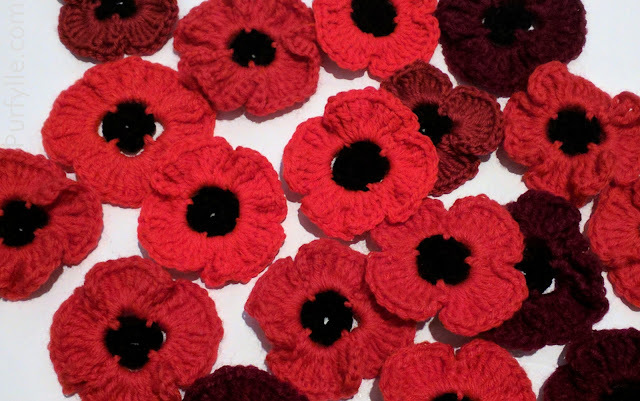 There is a fabulous red colourway that I saw last time I purchased that I would rather like to try. I've never tried crocheting rhombuses, I've pinned it to try sometime! They're nice and fast to work up. I hope you have as much fun as I did making them. That is so cute!! Very creative! Thank you so much for sharing this over at Bewitchin Projects Block Party!! Hope you will join us again this week! !